Pipes made of rigid materials, like concrete, clay, cast iron, can be replaced, without open trenches, by bursting the existing pipe while inserting the new one. This replacement technology is called pipe bursting (also known as pipe cracking or berstlining). The new pipe can be made of HDPE, PVC, ductile iron, PP or steel, having the outside diameter 30% or 50% larger than the diameter of the replaced old pipe. pipe bursting with hydraulic expanders. 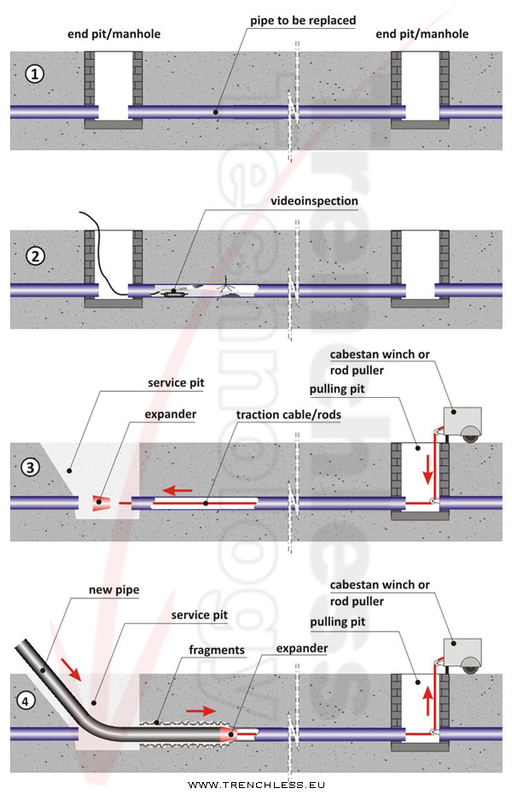 Static and dynamic pipe bursting are the most common no-dig replacement methods for rigid pipes. concrete, cast iron, clay, asbestos cement.